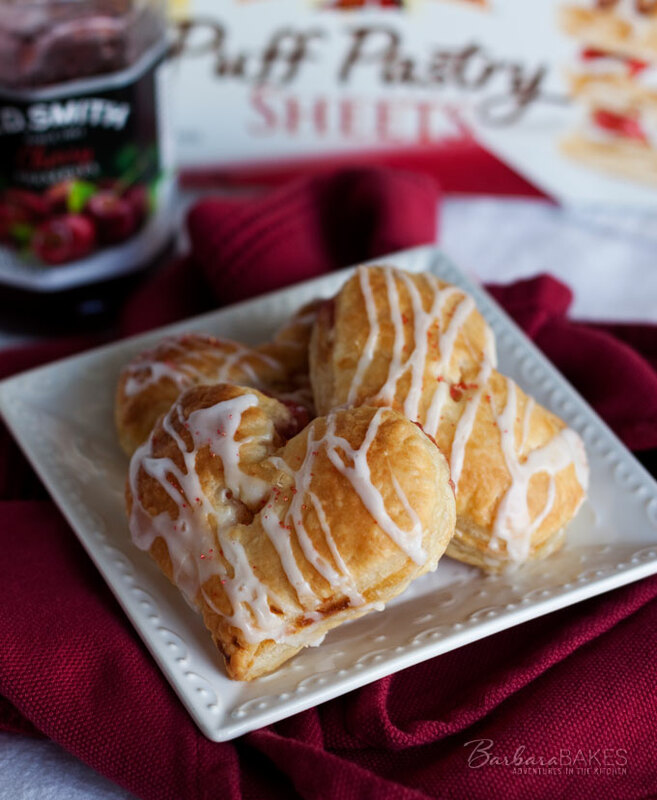 Sweet cherry preserves tucked inside a buttery, flaky puff pastry crust drizzled with a sweet glaze in a fun single serving heart shape. My family and I were talking about February being pie month, and I asked them what kind of pie they would like me to make. One of my twins said he wanted hand pies. Since Valentine’s Day is coming up soon. 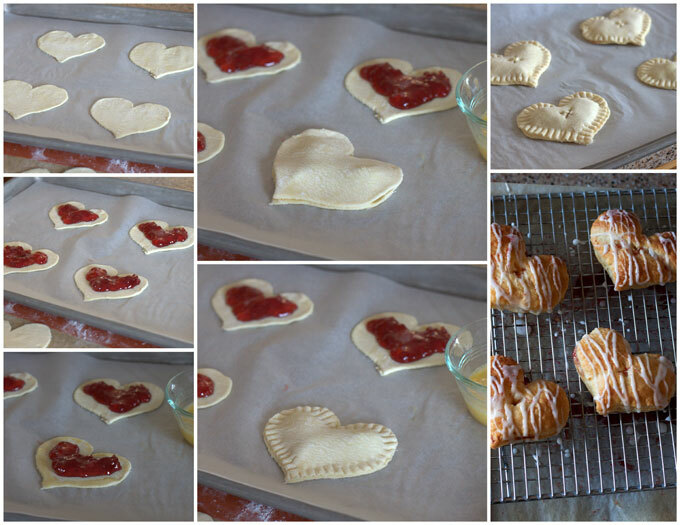 I thought it would be fun to make heart shaped cherry hand pies. This recipe is super easy and doesn’t require you to make pie crust. You start with frozen puff pastry sheets. Thaw it, roll it out a little bit, cut in into pieces, roll the pieces out a bit more, and then cut out your hearts. You could also just cut out the shapes from the big piece, but I find it’s easier to roll it out thinner if you cut them in to sections first. Because I didn’t want to waste any of the wonderful puff pastry dough, I also baked up the scraps. I just brushed the scraps with egg wash and sprinkled cinnamon and sugar on top. If you want you could just double the filling and make bigger rectangle hand pies. Once you have your cute little hearts cut out, they’re ready to be filled with the cherry jam. Then brush the edges with a beaten egg, top it with another heart, and use a fork to seal up the edges so your filling won’t leak out. I had one sheet of puff pastry in the freezer, but they come in a package of two. So I recommend doubling the recipe, because these were so delicious my husband and I ate all four hand pies and the scraps before my son got a chance to eat one. Guess I’ll need to make more soon. Thaw pastry sheet wrapped in plastic overnight in the refrigerator, or at room temperature for 40 minutes or until easy to handle. Unfold pastry sheet on lightly floured surface. 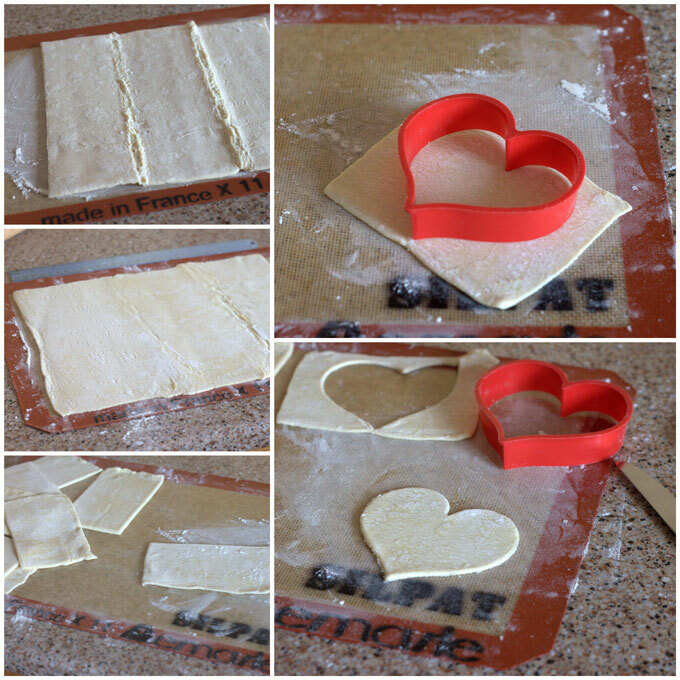 If there are any cracks in the pastry, sprinkle with water and press together to seal. Roll out puff pastry slightly so it's 12 inches long. Cut in to 8 pieces. Roll out each piece so it's big enough to to fit your heart. Cut out eight hearts. 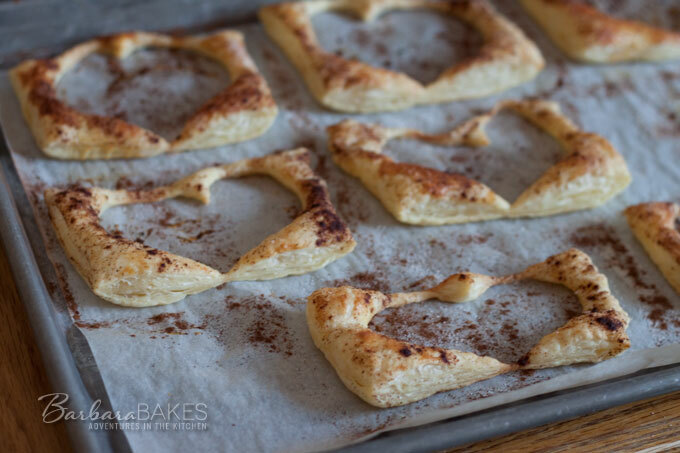 Put four hearts on a parchment-lined rimmed baking sheet. Spoon a tablespoon jam in the center of each heart. Brush edges with egg yolk and top each heart with another heart. Seal the edges together with the tines of a fork. Bake pies until golden and puffed, about 10 minutes. Whisk together powdered sugar and water until smooth. Drizzle glaze over hot pies. Oh gosh these look so tempting 🙂 I want one right now, yum! These are so cute, and they look delicious! Thanks for sharing the recipe. Love this idea and would like to make them for a valentine party tomorrow night. What was the size of your heart cookie cutter? Thanks! I’m not home today or I’d measure it, but I think it’s probably 3.5 inches. Your guests are going to love them. Be sure and seal the edges well, especially at the v.
I used my scoop yesterday. I love love love! My cookies were perfection. These looks o pretty and so yummy! Love them! Good Morning! When it comes to desserts, we know we can count on coming to your blog every time! Love these fruit filled tarts and love the size of them too! What a lovely idea, Barbara! I adore working with puff pastry because it’s so easy and the end product looks like it took forever to bake! Also, pie crust is one of the few things in baking that I’ve never been able to master very well, so puff pastry is the perfect solution. Happy baking and happy Valentine’s Day! So cute! A great Valentine’s Day idea. These look so good! Will be great for Valentine’s Day! My grandma used to make peach pies that were fried! They were so delicious! Unhealthy, but no one thought of that back then. I don’t remember them much, my mom loved them and they were made with her homemade pie dough. I think yours will be easy enough for me to try!! These look fab – I have cherry conserve which I made a couple of months so think I will be making these this week using that. Oh I want one……….or two. 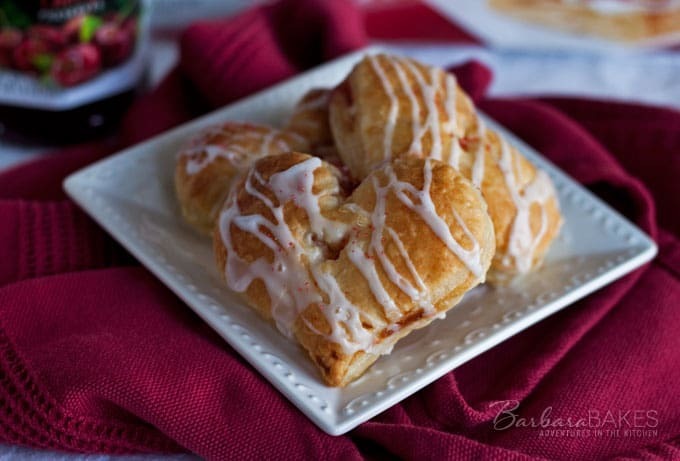 They look so good Barbara-and easy too….gotta love that!